As Global Head of Venture Investing, Arvind leads Citi’s efforts to invest in and partner with startups as a way to bring technology-based innovation to Citi’s businesses. He focuses his investments in Financial Services, Cybersecurity, and Enterprise Infrastructure. His portfolio includes Betterment, Bluevine, C2FO, Chef, Cylance, Illusive Networks, Persado, Pindrop, Silver Tail Systems (acquired by EMC), Tanium and vArmour. 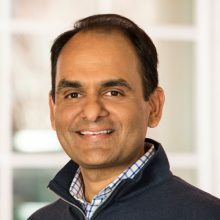 Prior to Citi, Arvind spent nearly a decade as a Managing Director at Menlo Ventures, where he was an investor and Board member at companies including Kazeon Systems, Cavium Networks, Solidcore, nCircle Network Security, Intelligent Results and Vhayu Technologies. Previously, Arvind was a design engineer and a Program Manager at Intel Corporation. Arvind obtained his BSEE from the Indian Institute of Technology, Madras, an MSEE from Case Western Reserve University, and an MBA with Distinction from Harvard Business School. He enjoys running, photography, and reading in his spare time. Arvind is passionate about golf, a passion, sadly, that his skill level does not match. He lives in Palo Alto, CA, with his wife and two sons.